When I saw this recipe over at the Crepes of Wrath, I just couldn't pass it by. How could I? 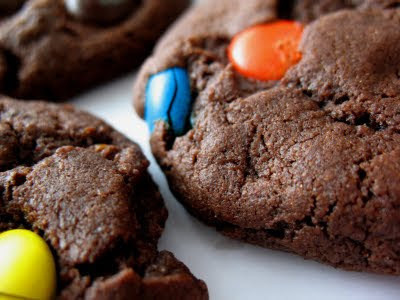 Dark chocolate cookies with a hint of orange, dotted with dark chocolate M&Ms? If you aren't following Crepes of Wrath on Twitter, or at least subscribed to the blog, go do it now. Really. Sydney is by far the most talented 20 year old cook that I know, and Jake adores every recipe I have found on her blog. 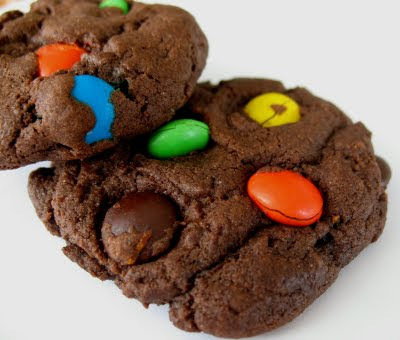 These cookies were amazing! The only change that I made was to bump up the hit of orange flavor with some orange extract. Make sure you really pay attention to the baking time. This is a case where you don't follow my usual rule of waiting until the cookies are set on top, because they continue to bake once you remove them. The tops will be squishy but set up as they sit for a bit. If you don't like orange and chocolate, just omit the orange peel and use vanilla extract. For the first time ever, I lined my cookie sheets with parchment paper. I used to scoff at people who did this, but seriously-it was great! The cookies just came right off, I didn't have to really wash them after, and it was fantastic! Sift the flour, cocoa powder, baking soda and salt together in a large bowl and set aside. In a different bowl, stir together the melted butter and sugars. Whisk in the eggs, stirring them in one at a time, then add the vanilla, orange extract, and orange zest. Pour the butter/egg mixture into the flour mixture, and stir with a wooden spoon just until no streaks of flour remain. Don't over mix. Fold in the M&Ms. With your hands, roll the dough into approx. 1 inch balls. Don't be afraid to make sure they have lots of candy in them-about 5 is good. Put them on the cookie sheets, leaving about 2-3 inches between them. They will spread out. Push the balls of dough down slightly with the palm of your hand to flatten a bit. Bake for about 9-11 minutes, watching carefully. The cookies will set at the edges and the tops will become cracked looking, like brownies. They won't appear baked, because the tops will be squishy, but they will set up nicely after you remove them from the oven. Remove from the oven and allow to sit on the cookie sheet for a few minutes before you remove them to a cooling rack.